Dandy Gilver fears that her summons to a house named Balmoral in Glasgow may prove to be a humdrum affair, but she is mourning her dog, Bunty, and feels a need to get out. 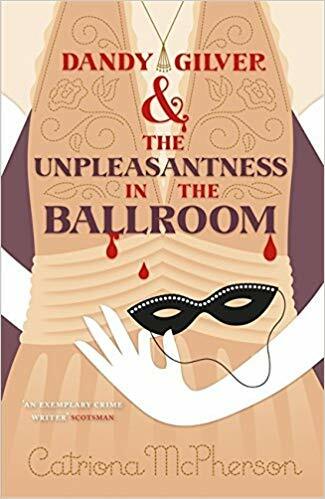 When she and her partner, Alec Osborne, arrive, their doubts about their customers are confirmed, for Sir Percival and Lady Stott are vulgar nouveau riche. However, they fear that their spoiled daughter, Theresa, or Tweetie, is in danger. Tweetie is taking part in a ballroom-dancing competition. She has begun receiving veiled threats that someone wishes her harm. The Stotts have urged her to quit the competition, but she is determined to continue. So, Dandy and Alec repair to the Locarno Ballroom to investigate. It seems that only Tweetie’s partner, Roly; her cousin, Jeanne; the pianist, Miss Thwaite; or another couple, Bert and Beryl, could have access to leave some of the messages. But what Dandy and Alec can’t figure out is why everyone around the ballroom seems so terrified. Shortly, they discover that there was a similar incident the year before that resulted in a death. Although I am gaining enthusiasm for McPherson’s contemporary thrillers, my taste for the Dandy Gilver mystery series is losing momentum. I like Dandy and Alec but feel that perhaps this series gets a little too mired in red herrings, if that makes any sense. 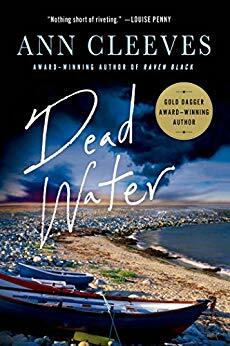 I was trying to read Ann Cleeves’s Shetland series in order, but somehow I made a mistake and skipped the one before Dead Water. That unfortunately makes me privy to a key plot point for the previous book but did not spoil this one. Jimmy Perez is on compassionate leave for reasons that readers of the previous novel will know, so he does not immediately become involved when the Fiscal, Rhona Laing, finds a body aboard the yoal that she shares with a group of rowers. The body is that of Jerry Markham, a reporter who left the island years ago to work in London. He has returned to Shetland to see his parents, the owners of a hotel, and for some other reason. He seemed to be working on a story, but if that is true, his editor knows nothing about it. 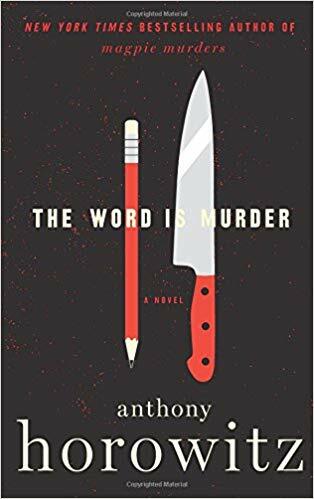 The mainland office sends Willow Reeves to be in charge of the investigation, and she immediately thinks the Fiscal isn’t telling everything she knows. The crux of the matter seems to be Markham’s reasons for returning to Shetland. Jimmy slowly gets drawn into the investigation, which soon finds that years ago Markham made an innocent young girl, Evie Watt, pregnant and refused to accept responsibility for it. Evie lost the child, and now she is on the verge of marriage to John Henderson, a pilot. Evie acknowledges that Markham tried to contact her but says she refused to speak to him. The team follows several leads, including a dispute over green energy, until another body surfaces and brings their attention back to Evie. This time the victim is her fiancé. Do the murders have something to do with Evie, or is it a coincidence that the victims were her ex and current lovers? Again, Cleeves creates a twisty and suspenseful mystery for Jimmy Perez to figure out. Her characters are convincing, and we are truly interested in their fates. Who is meant by the “she” in the title of The Punishment She Deserves is ambiguous at first. The word may refer to Detective Sergeant Barbara Havers, whose superiors, because of her behavior during her previous case, send her on the present case hoping she will mess up so they can transfer her. It may refer to her boss, Isabelle Ardery, whose drinking problem is seriously affecting her life and work. Perhaps it refers to one of the two controlling mothers Barbara and Isabelle encounter in their investigation. Or perhaps someone else. Isabelle and Barbara are dispatched to look into an investigation of death in custody to see if it was performed correctly. The death in question is the apparent suicide of Ian Druitt, a clergyman who had been arrested after charges of paedophilia. Ludlow’s PCSO Gary Ruddock was dispatched to bring Druitt in to an unmanned station to wait for officers to pick him up for questioning. While Ruddock was making some phone calls, Druitt apparently hanged himself using his stole and a doorknob. Barbara’s reaction is to investigate whether the death was indeed a suicide, but Ardery tells her their remit is only to determine whether the subsequent investigation was handled correctly. Nevertheless, Barbara uncovers a disturbing fact beyond the one that the allegation against Druitt was made by anonymous phone call. There was a gap of 19 days between the allegation and the order for the arrest, which was said to be urgent. Barbara includes this fact in the report she writes about the investigation, but Ardery orders her to remove the information because of political reasons. Troubled, Barbara asks Inspector Lynley’s advice. He tells her to leave out the information if she wants to keep her job, but he takes the unedited report and sends it above their boss’s head. The resulting explosion ends with Ardery called on the carpet and Lynley and Havers on their way to Ludlow to investigate thoroughly. Soon, Lynley and Havers have reason to believe that Druitt’s death was not a suicide. But believing that and proving it or finding the murderer are different things. 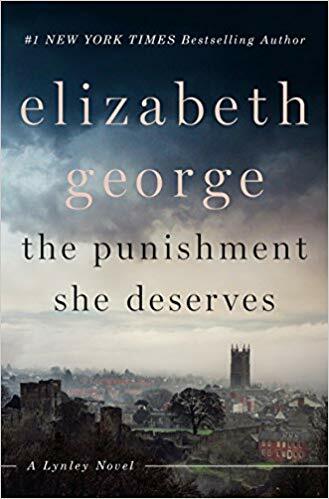 This novel finally shows Elizabeth George going back to form, concentrating more on the mystery than on the characters’ private lives and having her protagonists behave more like cops than they have in several of the previous novels. Although the private lives of Lynley and Havers were initially what made this series so interesting, I’ve felt that George has gotten too melodramatic with these plots in the last few books. So, it’s a relief having Barbara worry about tap-dancing class and Lynley concerned about how his relationship with his not very interesting girlfriend is going, but nothing more dramatic. This mystery is complicated, interesting, and difficult to guess. It involves characters you come to care about. I really enjoyed it. I’m glad about this, because I’ve wondered whether I wanted to continue reading this series, and now I’m looking forward to the next one. After a rare night out, Julie Armstrong returns home in the wee hours to find her son, Luke, dead in the bath. Her 14-year-old daughter, Laura, is sound asleep in her room. Luke has been despondent since the death of his friend, Thomas Sharp, from drowning. 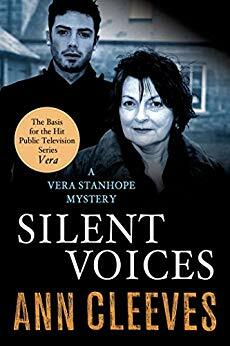 Julie assumes he killed himself, but Vera Stanhope’s team assures her it was not a suicide. Luke was strangled, his bath filled with scented oil and flowers. Felicity Calvert is surprised when she meets her son at the bus to find that her teacher has traveled out there to view their cottage with the idea of renting it. Felicity isn’t sure she wants to rent it again but is surprised when the young woman, Lily Marsh, leaves without asking the rate. 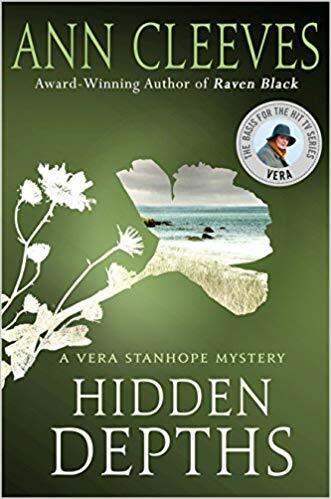 Vera’s attentions turn to the Sharps, a local criminal family, wondering if Davy Sharp blamed Luke for his son’s death. But Davy says it was a accident. Soon, another body is discovered in a tide pool by Felicity Calvert’s son. It is Lily Marsh, submerged in a pool surrounded by flowers. The Calverts are at the shore as part of Pete Calvert’s birthday celebration, accompanied by his three best friends, all bird watchers. This is another clever mystery by Ann Cleeves. Her characters are convincing, and her plots complex without being overly complicated. I am enjoying both the Ann Cleeves series I’m reading. And by the way, I wish everyone a safe New Year’s Eve and a happy new year! I’ve read almost all Catriona McPherson’s books, which up to now have fallen into two categories—her historical mystery series set in post-World War I Scotland and England featuring Dandy Gilver and her stand-alone present-day cozy thrillers, set mostly in Scotland. Scot Free is the first in a new series, the Last Ditch mysteries, featuring Lexy Campbell and set in California. Lexy is waiting to have her last meeting with clients before she returns to Scotland. Her marriage to an American dentist has turned out to be a big mistake. She is waiting at her office for the Bombaros, who hired her as a marriage counselor to help them keep their divorce amicable. After she helps them with divorce papers, she’ll be off. But the police arrive to question her. Mr. Bombaro is dead, having been murdered with fireworks. Elderly Vi Bombaro is the chief suspect, and Lexie is suspected of being her accomplice. Lexie can’t believe Vi is guilty, and she is even more sure of that when Vi’s niece Sparky shows up with her new husband and a couple of thuggish business associates, and they begin taking over Mr. Bombaro’s fireworks manufacturing business. So, she decides to investigate. Lexie has her own problems, however. She is currently homeless, and her clothes are locked in her office, the pass for which has expired. So, she checks into the Last Ditch motel and into the realm of a collection of colorful characters. 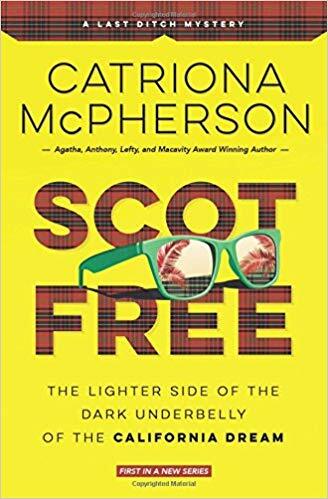 Scot Free is a funny, enjoyable novel even though McPherson signaled a little too obviously the identity of the murderer. I am a little worried, though, about the change of locale. If McPherson decided to move to the United States to appeal more to American audiences, I have to say that much more appealing to me are her Scottish settings, especially the atmospheric ones of her thrillers. The Scottish fish out of water theme can be funny, but I can imagine it getting old quickly, along with the cast of eccentric characters at the Last Ditch. For one thing, Lexie makes a lot of generalizations about Americans based on the Californians she meets, and we all know that Californians aren’t that representative of average Americans. Also, she gets at least one thing wrong. The American cop catches her in a lie because she claims that someone says “I’ve got . . . ” instead of “I have . . .” I believe that most people I know are just as likely to say it one way as the other. I noticed a few other small problems as well. These are not very big criticisms. I just hope that McPherson doesn’t drop her moody present-day stand-alones for this series, because they are my favorite.